Go to original pattern for design DROPS 195-17. 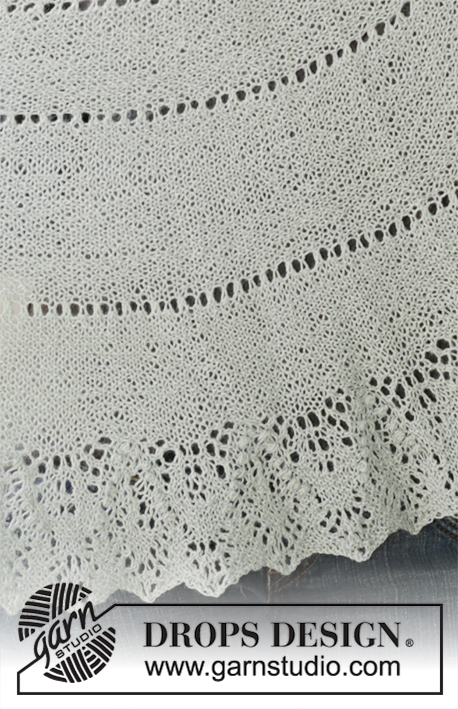 Knitted shawl in DROPS Lace or BabyAlpaca Silk with garter stitch and lace pattern. 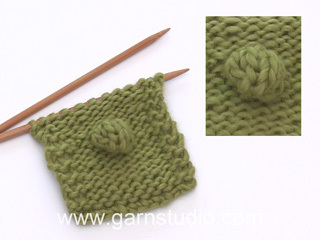 23 stitches in width and 45 rows vertically in garter stitch = 4'' x 4'' (10 x 10 cm). 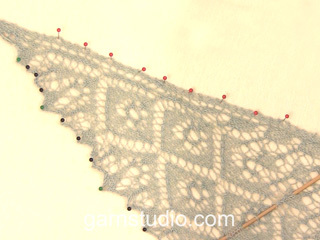 NOTE: If using DROPS Lace soak and stretch the shawl to size afterwards, the knitting gauge is thus not that important. But to get a sense of whether you are working too loose/tight, work a test on needle size 3.5 mm / US 4 in garter stitch to make sure that the knitting gauge is correct. DROPS CIRCULAR Needle size 3.5 mm / US 4, length 80 cm. CROCHET Hook size 3,5 mm / E/4 (OPTIONAL). 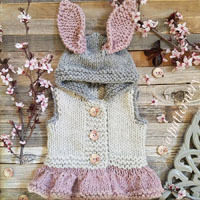 You can get the yarn to make this pattern from	15.40$. Read more. 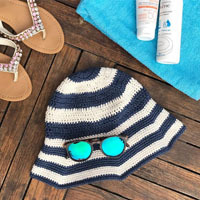 A bobble can be made in different ways. Method 1 makes a bobble that is worked together on next row from wrong side. Method 2 makes a bobble with crochet hook and this bobble is done on this row. Choose the method that suits you best, make a test as there are many stitches on the needle when working the diagram. Work 7 stitches in 1 stitch as follows: * Knit 1, 1 yarn over *, work from *-* 3 times in total and finish with knit 1 = 7 stitches. It is important to make the stitches somewhat loose (approx. 1 cm / 3/8'' long) or it might be difficult to knit them together later. 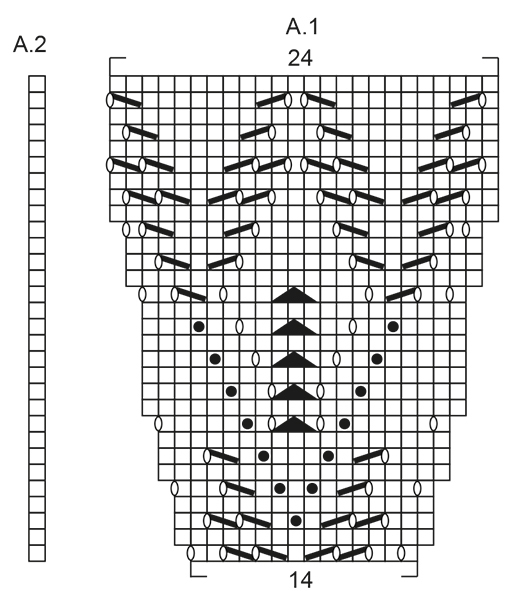 Do not turn piece but work the rest of row as explained in pattern/diagram. When working next row from wrong side, purl all the 7 stitches in each bobble together. METHOD 2: Use a crochet hook in the same size as needle. Use the crochet hook as a knitting needle and work 7 stitches in 1 stitch as follows: * Knit 1, 1 yarn over *, work from *-* 3 times in total and finish with knit 1 = 7 stitches. It is important to work the stitches somewhat loose (approx. 1 cm / 3/8'' long). Make 1 yarn over on hook and then pull it through all loops/stitches on hook, tighten yarn and slip loop on hook on to right needle. 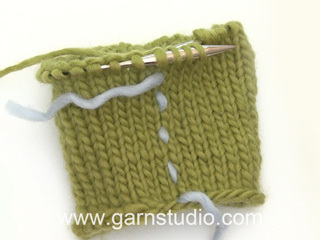 To avoid a tight bind-off edge make yarn overs when binding off. Make a yarn over over all yarn overs from previous row with yarn over, bind off yarn over as regular stitches along the way. Make sure not to tighten the yarn. 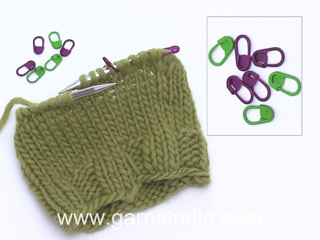 If the edges still are tight use a larger needle size for bind-off. When using another yarn than Lace from yarn group A, there is no need to stretch to measurements, but place it gently out in shape. Leave to dry. Repeat the process when the shawl has been washed. Work back and forth, top down on circular needle in GARTER STITCH - see explanation above. ROW 1 (= right side): Make 1 yarn over, knit 1, 1 yarn over and knit the rest of stitches (= 2 stitches increased). ROW 2 (= wrong side): Make 1 yarn over, knit 1, 1 yarn over and knit the rest of stitches (= 2 stitches increased). Work ROWS 1-2 3 more times (4 times in total) = 29 stitches on needle. Make 1 yarn over, knit 1, 1 yarn over, knit 1, * 1 yarn over, knit 2 together, 1 yarn over, knit 1 *, work from *-* 8 times in total and knit 3 (= 10 stitches increased) = 39 stitches on needle. Work next row as follows from wrong side: Make 1 yarn over, knit 1, 1 yarn over and knit the rest of stitches (= 2 stitches increased) = 41 stitches on needle. Work ROWS 1-2 10 times in total = 81 stitches on needle. Make 1 yarn over, knit 1, 1 yarn over, knit 2, * 1 yarn over, knit 2 together, 1 yarn over, knit 1 *, work from *-* 25 times in total and knit 3 (= 27 stitches increased) = 108 stitches on needle. Work next row as follows from wrong side: Make 1 yarn over, knit 1, 1 yarn over and knit the rest of stitches (= 2 stitches increased) = 110 stitches on needle. Work ROWS 1-2 15 times in total = 170 stitches on needle. Make 1 yarn over, knit 1, 1 yarn over, knit 1, * 1 yarn over, knit 2 together, 1 yarn over, knit 1 *, work from *-* 55 times in total and knit 3 (= 57 stitches increased) = 227 stitches on needle. Work next row as follows from wrong side: Make 1 yarn over, knit 1, 1 yarn over and knit the rest of stitches (= 2 stitches increased) = 229 stitches on needle. Work ROWS 1-2 5 times in total = 249 stitches on needle. ROW 3 (= right side): Knit 1, 1 yarn over and knit the rest of stitches (= 1 stitches increased). ROW 4 (= wrong side): Knit 1, 1 yarn over and knit the rest of stitches (= 1 stitches increased). Work ROWS 3-4 17 times in total = 283 stitches on needle. Knit 2, * 1 yarn over, knit 2 together, 1 yarn over, knit 1 *, work from *-* 93 times in total and knit 2 (= 93 stitches increased) = 376 stitches on needle. Work next row as follows from wrong side: Knit 1, 1 yarn over and knit the rest of stitches (= 1 stitch increased) = 377 stitches on needle. Work ROWS 3-4 15 times in total = 407 stitches on needle. then work according to diagram A.1 and A.2 – READ ALL OF THE FOLLOWING SECTION BEFORE CONTINUING! There are many stitches on the needle and we recommend that you use marker threads or markers to mark where each diagram begins and ends. Insert a marker thread/marker after every 14th stitch and move them upwards when working. Work A.1 29 times in total in width, work A.2 over the last stitch. Work diagrams 1 time vertically. 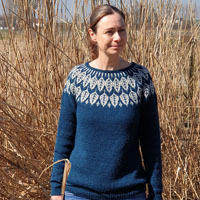 When diagrams are done, loosely bind off on next row from right side - read BIND-OFF in explanation above. Place the shawl in lukewarm water until it is soaking wet. Carefully squeeze the water out of the shawl - do not twist the shawl - then roll the shawl in a towel and squeeze to remove more water - the shawl will now only be moist. Use another yarn than Lace from yarn group A - read SHAPING in explanation above. Place the shawl on a carpet or mattress - carefully stretch it out to size and fasten it with pins. Leave shawl to dry. Repeat the process when the shawl has been washed.